February 7, 2009 will forever be known in the minds of most Australians as “Black Saturday.” This was the day deadly bushfires roared through several communities in Victoria about one hour north-east of Melbourne. The fires raged out of control for weeks. Tragically, 173 people lost their lives and 414 were injured. Close to 1,100,000 acres (450,000 hectares) were burnt and over 3,500 structures were destroyed with thousands more damaged. We don’t find adequate statistics on the millions of animals in the fire’s path that were killed or subsequently died as a result of injuries. 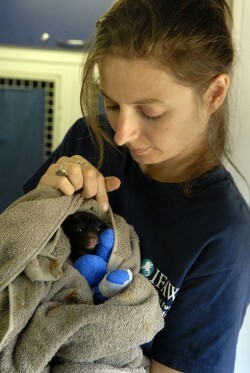 Tania Duratovic cares for injured animals as part of the International Fund for Animal Welfare (IFAW). Photo by Jerry Galea. My former employer deployed me to lead a team to help with the rescue and treatment of both domestic and wild animals who had suffered terror and burns ranging in scope from moderate to severe; accidental injuries such as collision with fences, trees, etc. while trying to flee; dehydration; starvation; heat related stress; environmental exposure; loss of habitat; separation from peers and human caregivers; motor vehicle accidents; being orphaned or some disability resulting from the fire. We set up our treatment site at the main staging area for the Kinglake-Murrindi fire complex, the largest of the many fires burning and the region where 159 of the 173 lives were lost. We were the only non-government animal rescuers allowed into the fire area. Even residents were not allowed in. Upon arrival, we passed the police checkpoints and entered the burnt area. As it had only been two days since the main fire had passed through, the visual impact was immediate. It has been said that the amount of energy released during the firestorm in the Kinglake area was equivalent to the amount of energy released by 1,500 Hiroshima-sized atomic bombs. The fire had obliterated everything in its path and all that was left in many places were bits of brick and corrugated iron, the only evidence a family once lived there. Yet in other places, the house next door stood unscathed. We passed cars on the side of the road, some fused together from the heat. We drove by silently, all thinking the same thing. A day or so later, these same cars had teams of police forensic experts swarming over them – people had died in them trying to escape the fire. Tania Duratovic saw many large animals who had suffered in the 2009 bushfires in Australia. Photo by Jerry Galea. What was equally distressing were the bodies of the larger animals such as horses and kangaroos lying scattered across paddocks. Many we saw were not even externally burnt, but had likely died from internal burns caused by heat and smoke. There was so much death all around us. For the next three weeks I slept on site in a van which I shared with my good friend and veterinarian, Dr. Ralph, who I had asked to join me in the rescue. The two of us were on call 24-hours a day, with most days beginning early in the morning and not stopping until after 1:00 am. As a Buddhist, the most challenging thing I found was dealing with the death process. If I was in my own at home, it wouldn’t be such a challenge. I would follow the prayers and practices as advised by Lama Zopa Rinpoche, circumambulate the animal around many holy objects, chant lots of mantras loudly and play CDs, give blessed water if possible and so on. This, of course, was not possible in the context of working with non-Buddhists. Yet, it didn’t seem enough to just secretly do visualizations when these animals were dying, dead or being euthanized in front of me. This was such a critical time in the lives of these fellow beings. We are taught by Lama Zopa Rinpoche that to deliberately stop a living being’s life prematurely without clairvoyance can often simply lead to more suffering for them in the animal realm, or worse. However, most people view euthanasia as the humane thing to do. At the fires, many animals were in the position of being euthanized. Fortunately, my team tries harder than most to keep an animal alive if there is a possibility of survival and rehabilitation. But at other times, the decision is made to not keep the animal alive. This scenario can be a huge dilemma for a Buddhist with vows. This kangaroo was severely burned during Black Saturday, he was discovered with his paws covered in maggots, January 2009. A local resident had seen a large male kangaroo moving slowly around her property for a few days. A kangaroo moving slowly is not a healthy sign. With some careful planning, we managed to catch the ‘roo, and in what looked like typical Steve Irwin fashion, several of us held him to the ground while Dr. Ralph sedated him for closer examination. “OK, this is it,” I thought. “He’s about to be killed, his life is about to end. Critical moment. Gotta do something.” As Dr. Ralph sedated him, the president of the wildlife group we were working with and I remained with him. This woman kept stroking him while I was quietly doing prayers and mantras. I didn’t want to be too overt as I was working with peers. Then I thought, “This is really, really important for this animal. This may be his ONLY chance to get out of the lower realms for eons.” I said to this woman, who fortunately I knew quite well, that I just have to do some Buddhist prayers for the kangaroo that will help in his death. She was quite upset that the ‘roo was going to die and so was happy for me to do the mantras. It turned out that the ‘roo was only given a sedative. There were no drugs at hand to deliver the lethal injection. As he was now heavily sedated, the quickest and most humane method to euthanize him was to shoot him in the head at close range! I despairingly thought, “I can’t say mantras in his ears while this happens!” I moved back, keeping away from everyone else as I continued with the prayers, etc. The man who delivered the fatal shot was himself almost killed in the fire while trying to rescue his horses – he refused to leave one of them behind. 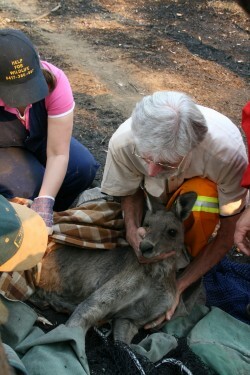 Following the firestorm, he spent all his time searching for injured animals to bring to us to be treated. For him to have to kill an animal was not something he did lightly. I knew he would take his utmost care. I heard the shot go off, followed by another. I felt like I had been thumped in the heart. Everyone else was by the cars, talking to the resident property owner, distracting her. I waited for the guy who shot him to move far enough away that he couldn’t see me approach the body. As bizarre as it sounds, I really felt that I had to be the first one to touch the body, on the head, and say mantras in his ears. I took a deep breath, dashed up to the animal without looking too closely, bopped him on the head with a blessing cord from Rinpoche (I didn’t have anything else on me at the time) and quickly said some mantras. I ran off before people could see what I was up to. Throughout the fires there were other similar incidents that I faced. As traumatic as they were, and as helpless as I often felt, I could rejoice in the little fact that because I was there saying even one single mantra, that that would make the difference between eons of suffering in the lower realms and planted the seed of enlightenment, of ultimate happiness. This is actually a very powerful gift, one that each and every one of us can give. Indeed, it is our duty to our fellow sentient beings to share that gift with them. Tania, an ecologist, zoologist and animal welfare consultant, is co-director and co-founder of Enlightenment for the Dear Animals, an FPMT project that aims to help people benefit animals. The project website will be a resource for students and centers, providing advice, news, and linking projects and people who are helping animals around the world.